I play around with a personal Foursquare account–partly because I enjoy experimenting with tech toys, partly because it is game-like (and I have fun with that), and partly in order to understand something about the service. I would like to be able to have an (at least somewhat) intelligent conversation should it ever come up in my information-consultant role as a librarian. 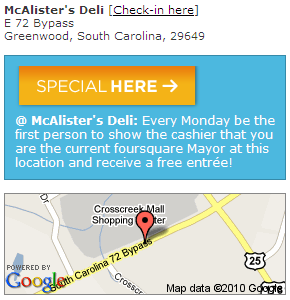 So it goes like this: Visit McAlister’s (and enjoy a great meal) as many times as possible, check-in with Foursquare more than anyone else, and enjoy one of those great meals on the house. It’s incentive-filled. Friendly competitive. Simple. Location-based social networking applications–like Foursquare, Gowalla, BrightKite, and Loopt–are seeing a growth in popularity. (RJMetrics tracks usage data for Foursquare and Gowalla.) Some in the business world have recognized this begun exploring ways to incorporate these social networking tools into their advertising strategy. Likewise, some of us in the library world are asking ourselves, “How can we use applications like Foursquare to connect with our users who are sporting mobile devices and enjoying a bent for social networking?” It’s not necessarily about new resources and services. It’s not even about the social networking app. It’s entirely about making connections–making our libraries relevant to users. This topic has been discussed for some time and at some length among librarians. Cecily Walker (Vancouver Public Library) blogged about Foursquare and libraries. David Lee King (Topeka & Shawnee County Public Library) wrote a post on the subject and then a follow-up post. Kyle Jones (contributor to the Tame the Web website) told of the Darien Library experiment with Foursquare and their library users. And Jenny Levine (The Shifted Librarian) shared her Foursquare “a-ha” moment with us. These are just a few examples. Librarians, is your library using any of the location-based social networking sites to connect with your users? What kind of things are you doing? Are your efforts strengthening, enhancing, growing, etc. your connections to your users? Library users, are you using location-based social networking sites like Foursquare? How would you like to see your library using these social networking sites to make special offers to you and have some fun along the way?